Another lateish startthis morning. We decided to do a stint in magic kingdom so thought the best plan would be breakfast before we get there and then leave for dinner. 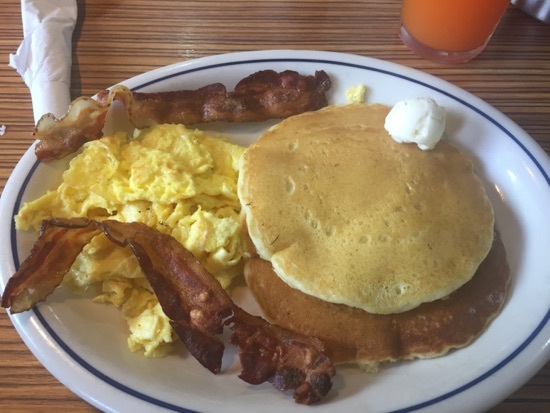 We chose IHOP for breakfast as it's just down the road and we enjoyed it so much on our first morning. We enjoyed it so much we got pretty much exactly the same again! 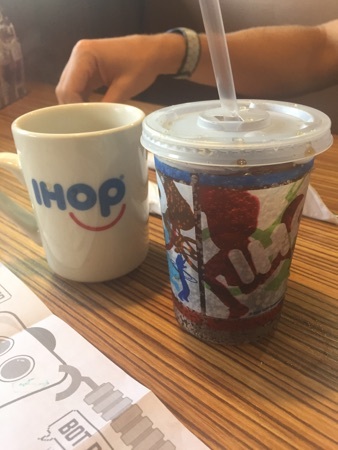 DD had Coke and DH had coffee. 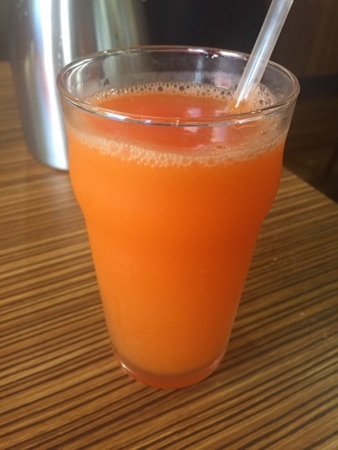 I had a dole fruit juice mix recommended by our server. This just tasted like tropical juice but was nice. 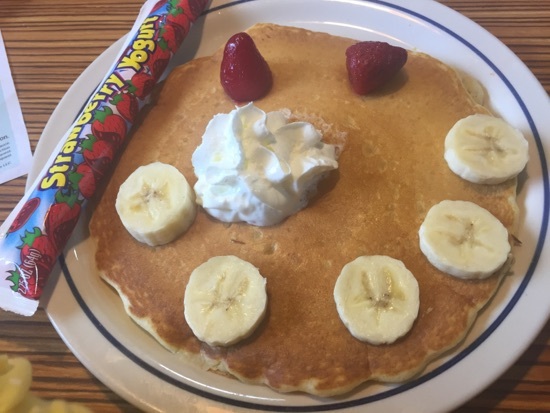 DD had the create a face pancake... again. 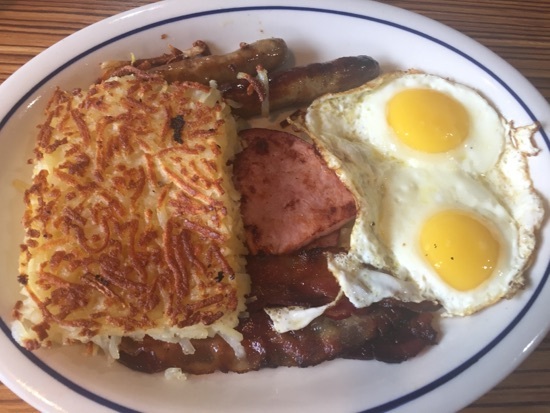 DH had the big breakfast, this also came with 2 pancakes. And I had the 2 x 2 x 2, I chose my eggs scrambled and 2 slices of bacon. 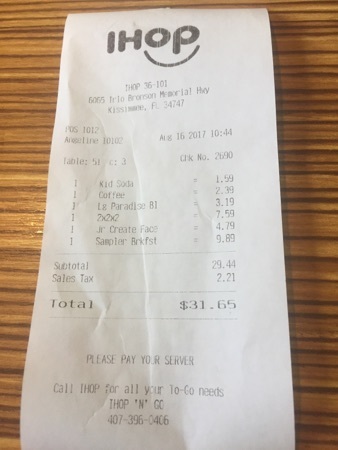 Total came to $31.65 and was enough to see us through to dinner. 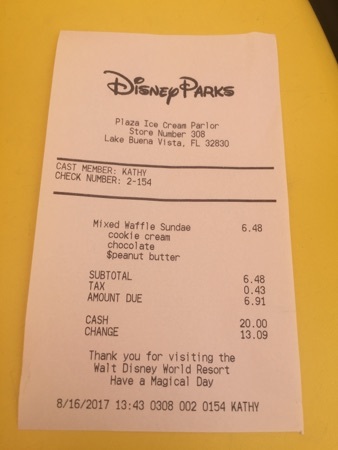 We left IHOP at 11 and we're parking in the mk parking lot by 11.10am. We got quite a lot done in mk despite the summer crowds, we managed 7dmt, splash mountain, haunted mansion, pirates, Winnie the Pooh, Cinderella & elena of Avalon, barnstormer, dumbo and meet Mickey Mouse. 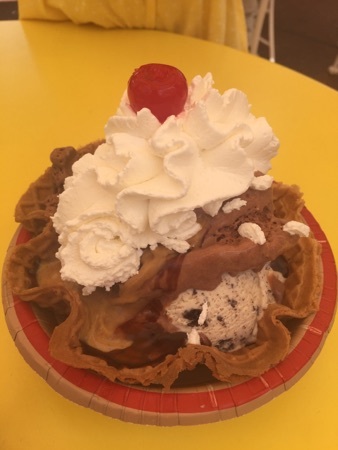 Mid afternoon we got in ice cream sundae from plaza ice cream parlour, being creatures of habit we got our usual, the plaza sundae with chocolate and cookies & cream ice cream with hot fudge and peanut butter sauce. These are so good! Hands down best ice cream sundae ever! This comes to $6.91 and is worth every single penny! We left mk around 5.30 and drove up towards crossroads to lonestar steakhouse for dinner. 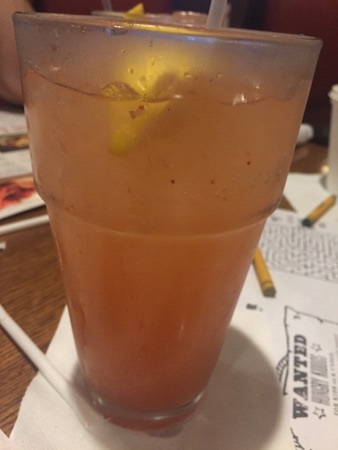 DD ordered a Coke and DH and I both had strawberry lemonade. This was really good and was made with real strawberries. 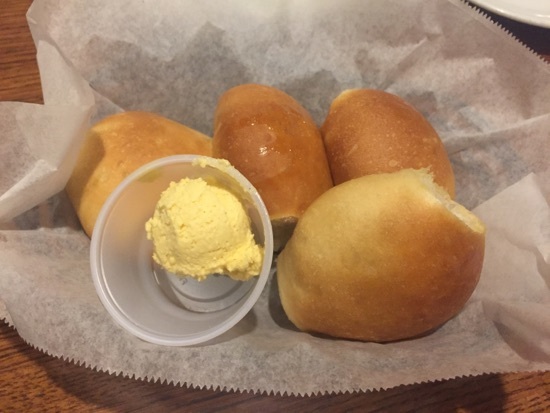 We were given some warm bread rolls and cinnamon butter to eat while we waited for our food, the bread was lovely but the butter was abit strange. 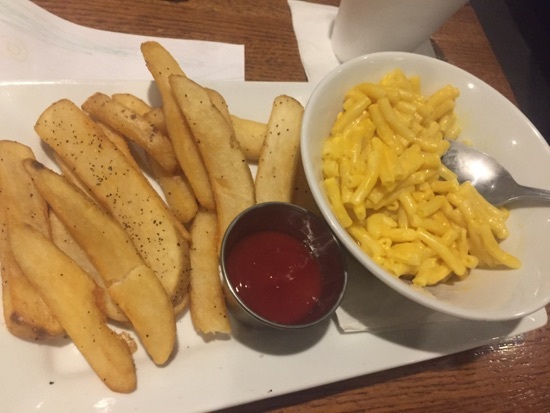 DD went for the kids mac and cheese. You got the choice of a side with that and she went for steak fries. She enjoyed the Mac and cheese but didn't eat many of the chips. 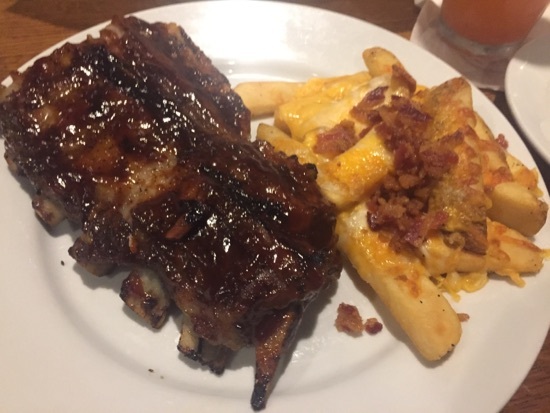 I had the half rack of ribs, you chose 2 side with this. I went for steak fries and paid the extra 99 cents for the cheese and bacon topping. The ribs were so tender and the meat fell right off them, the BBQ sauce was really tasty and there was plenty on them so they weren't dry. The 'fries' were good especially topped with cheese and bacon. The other side I chose was the signature wedge lettuce. The brought this out as a starter. 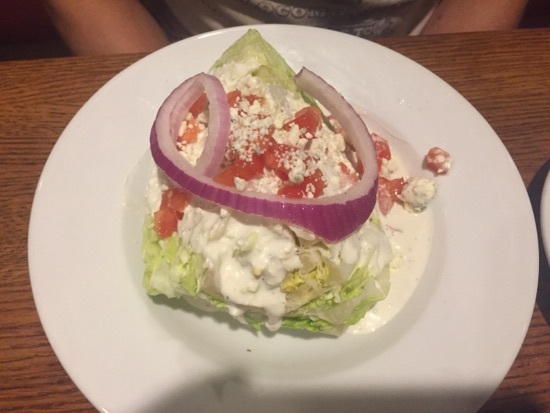 It was really good, the lettuce was really fresh and crisp and there was loads of blue cheese dressing and blue cheese on top. DH had the 14oz ribeye. He got the same sides as I did. He really enjoyed this! 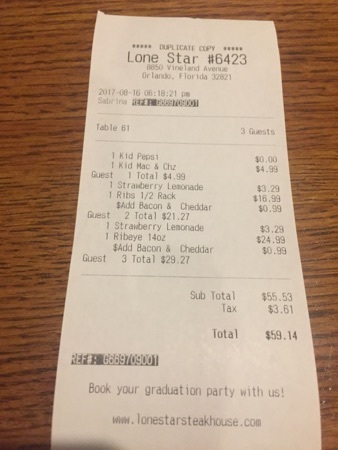 This is our most expensive meal so far, the total came to $59.14 but we all enjoyed what we ordered so it was well worth it. After dinner we called in at the Vinland outlets for a spot of shopping, the outlets are lovely and quiet in the evening, we will definitely shop at this time in the future! 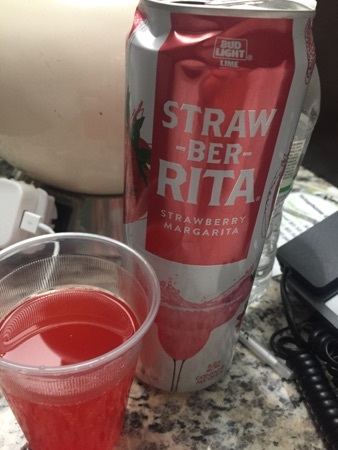 When we got back to our hotel I had a few glasses of straw-bet-Rita that we picked up at racetrack gas station. This was really nice and cost about $3.50 for a 25 fl oz can. New Photo Added by missdopey - 17 Aug 17 3:45 AM. 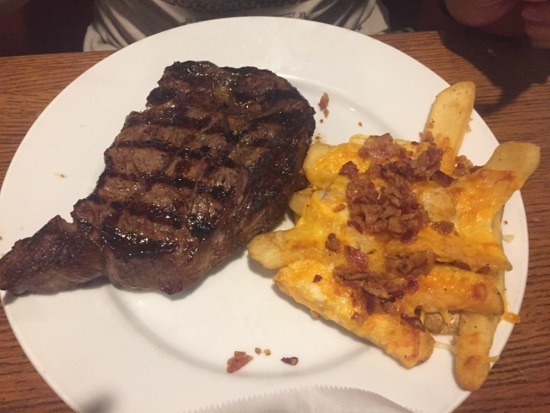 What a good day, the ribeye and the ribs look lovely and the cheese n bacon topped fries - yum.